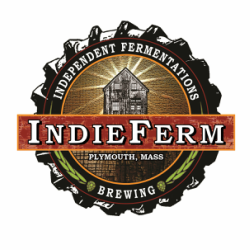 Independent Fermentations Brewing (aka IndieFerm) specializes in making craft beers with locally grown ingredients. Many of our beers are inspired by the Belgian farmhouse brewing tradition but we also make other styles. We brew what we like to drink and that covers a lot of territory. We primarily use Massachusetts-made barley, wheat, and rye malts as well as malt from farmers and maltsters around the Northeast that share our ethic of keeping it local and independent. Most of our hops come from Massachusetts but there are some varieties that we like that simply don't grow here. So we supplement with other sources when we need to. On average, our beers are brewed with about 80% locally sourced ingredients. It costs us more this way, but it is worth it to keep the money local and support people who work and think like we do. We believe in making local beer with local ingredients. Help us fight the mono-culture: "Think Independent, Drink Independent". In early 2013, after years of amateur home brewing, we began the process of converting our barn into a small professional brewery. In April 2014 we brewed our first professional batches of beer and started selling it to places near our home base of Plymouth, Mass. Starting in the basement of our barn with no rent and literally low overhead was a great way to get started but was never meant to be forever. In late 2015 we moved the brewery to 127 Camelot Drive in Plymouth (near Rt 3, Exit 5) where we now also have a tap room for on site sales and a homebrew shop and fermentation studio. And the rumors are true, we are looking at expanding again in 2018. We self-distribute our beer with a focus on southeastern Massachusetts. We have been packaging in 22 oz "bomber" bottles for the stores but we have ordered a Wild Goose canning line that should be in operation by the end of 2017. We package in half barrel and 1/6 barrel kegs for the restaurants and bars. We currently have about 45 customers. Please check the map on the "Find IndieFerm" page for the latest update. The tap room is open for tastings, tours, and pints Thursdays from 3-7 PM, Fridays from 3-7 PM, Saturdays from 12-7 PM, and Sundays from 12-4 PM. We have 8 beers on tap. The taproom phone number is 508 746-4634. You can stay up to date with us by following the brewery at www.facebook.com/indieferm and www.twitter.com/indieferm. We hit those with updates a lot more often than this page. In 2016 purchased the former Plymouth Homebrew Supply and moved it to 127 Camelot Drive with the tap room and brewery. Renamed IndieFerm Supply, the shop also has supplies and equipment for homebrewing, winemaking, and fermented foods like kombucha, yogurt, and cheese. We also have classes on homebrewing and fermented foods. The shop is open Thursdays and Fridays from 12-7, Saturdays from 9 to 7, and Sundays from 11 to 4. You can call the shop at 508 746-2515 or keep up on www.facebook.com/indiefermsupply.